Self-reported physical activity (PA) and screen time exposure in adolescents with chronic kidney disease (CKD) has not been evaluated. We performed a cross-sectional analysis of PA and screen time in 224 adolescents at entry into the Chronic Kidney Disease in Children (CKiD) cohort. We compared proportions of CKiD vs. healthy 2012 National Health and Nutrition Examination Survey (NHANES) participants reporting the recommended 60 min of PA 7 days/week or ≤ 2 h/day of entertainment screen time (binomial probability test). Within CKiD, we assessed correlates of PA and screen time using multivariable logistic and linear regression and examined longitudinal data for 136 participants. Median age of CKiD participants was 15 years, and 60 % were male. Median estimated glomerular filtration rate (eGFR) was 41.3 (IQR 30.8, 52.3) ml/min/1.73 m2. Only 13 % of CKiD participants met recommendations for PA vs. 25 % of NHANES (p < 0.001), while 98 % in CKiD exceeded the recommended screen time vs. 73 % in NHANES (p < 0.001). Within CKiD, obesity (p = 0.04) and lower eGFR (p = 0.02) were independently associated with greater screen time. Adolescents with CKD engage in significantly less PA and greater screen time than healthy youth in the United States, and this may worsen over time. Data in this manuscript were collected by the CKiD prospective cohort study with clinical coordinating centers (principal investigators) at Children’s Mercy Hospital and the University of Missouri-Kansas City (Bradley Warady), Children’s Hospital of Philadelphia (Susan Furth), Central Biochemistry Laboratory (George Schwartz) at the University of Rochester Medical Center, and the data coordinating center (Alvaro Muñoz) at the Johns Hopkins Bloomberg School of Public Health. The CKiD study is supported by grants from the National Institute of Diabetes and Digestive and Kidney Diseases, with additional funding from the Eunice Kennedy Shriver National Institute of Child Health and Human Development and the National Heart, Lung, and Blood Institute (U01-DK66143, U01-DK66174, U01-DK82194, U01-DK66116). This project was supported by NIH grants T32 DK007006 (SLC), NIH Grants K23 DK093556 (MRD), and K24 DK078737 (SLF). The content is solely the responsibility of the authors and does not necessarily represent the official views of the NIH. The Children’s Hospital of Philadelphia Institutional Review Board determined that this study met eligibility criteria for exemption according to 45 CFR 102(f). The authors receive funding from the following sponsors for research outside the submitted work: Genentech, Inc (MRD) and Mallinckrodt Pharmaceuticals (MRD, SLF). The authors have the following consultancy agreements: Infiniti Medical (MRD). The remaining authors have no conflicts of interest to disclose. ClinicalTrials.gov. 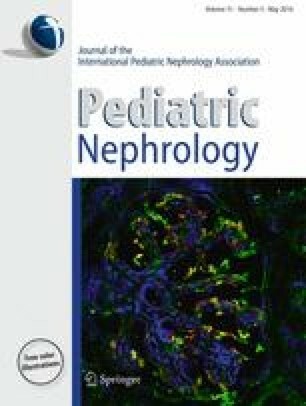 Chronic Kidney Disease in Children Prospective Cohort Study (CKiD). Retrieved from http://clinicaltrials.gov/ct2/show/NCT00327860 on 18 March 2015.